John Wyndham, The Chrysalids. London: Penguin Books. 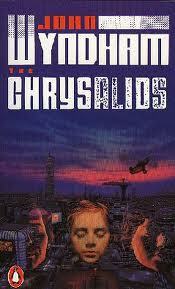 John Wyndham’s The Chrysalids was one of the seminal books of my childhood. I first read it at about 10, and to this day I still read it every couple of months. There are passages I could probably recite from memory. What fascinated me about this book was partly the setting, and how comfortably it settled with New Zealand’s iconic anti-nuclear policy – in The Chrysalids, the mutated survivors of nuclear war headed towards New Zealand as a relatively pristine haven from the resulting environmental and social catastrophe. It also introduced me to the idea of mutation – both biological and cultural. I didn’t recognise it in so many words when I first read the book (at ten years old, genetic mutation and social upheaval as such were still far in my mental future) but the idea that one sudden event could prompt an explosion within the human body, and the beginnings of a new type of human being… that was fascinating. What was even more fascinating was the way that this new type of human was treated – hunted down by the genetically pure, sterilised, and thrust out into the wilderness. The really creepy thing was that people would suddenly turn on their neighbours. We see this in the real world all the time – the Rwandan genocide is a particularly brutal example of a flash-point being reached, where neighbours are suddenly dehumanised due to social and cultural expectations of “us” and “other”. If anything, The Chrysalids represented possibility, and that possibility continues to define the book for me: the idea of sudden and drastic genetic change – how it may have occurred in the past, how we have the capability to bring it about today, why we retain that ability, knowing what it can do… and how we would cope with any possible results. Being raised in a non-religious family, The Chrysalids was my first real experience of the depths to which religion could be twisted to justify the inexplicable in order to make it understandable. How many could stand up against the need to find meaning after nuclear catastrophe, when scientific knowledge is lost and religion appears to provide a means of protection and escape – if only one can conform enough? This fear of difference and nonconformity – biological and intellectual – and the wholesale rooting out of these perceived spiritual imperfections is chilling. The child David’s dream about his father sacrificing his six-toed friend, Sophie, as he sacrificed a mutant calf is chilling, not just for the cruelty but for the indifference. As horrible as this childish dream is, however, if pales to the later realisation of Sophie’s life as an adult – mutilated, sterilised, and thrust out into the radioactive Fringes as a child, as an adult still living there as the lover of a mutated spider-man who would throw her over in an instant for a woman who could give him children. (It appears that only the women were sterilised – male Blasphemies escaped that fate in one of Wyndham’s rare slips.) In her instinctive emotional understanding and her knowledge of her own limitations Sophie despairs: wisdom banished to the wilderness. Wyndham is careful enough to emphasise the horror of this war-induced dystopia in two different ways. He refuses to make the dystopian community of Waknuk and its surrounds a homogenous set of people. David is exposed to the worst of it, as his father Joseph is a true and unrelenting bigot who is happy to crush his own family in the name of faith. Indirectly, this exposure also allows David to find the humanity in others – in his Aunt Harriet (who drowns her mutated infant and herself to escape having to give up her baby) he sees the possibility of an adult figure prioritising love over religion and its mandated conformity. As he ages, he sees more individuals who think this way, but they are always individuals – there is never the possibility of a community of the dispossessed. Purity of species overrides purity of heart, but even those entrusted with preserving the former can be decent enough to preserve some of the latter. The Inspector who condemns Sophie comforts David more than his father does. The growing claustrophobia felt by David and his telepathic friends is real and immediate. Despite their abilities, they are powerless in a world of rigid power structures, where governments and individuals take pride in the power of being a true Norm. This takes its toll on them, who would share in that power without truly meriting it by the standards of their own community. They are betrayed by one of their own (and Anne is to be pitied as much as Sophie and Harriet), tortured, killed, and their leader left behind in anonymity as they escape to Zealand, where the new species is growing. As the most ordinary of the Chrysalids, David is the pivotal figure. He is neither as powerful as his little sister Petra, as practical and competent as his lover Rosalind, or as intelligent as Michael. All David has comes from his genetic makeup – his psychic abilities, his growing realisation of difference, and his legacy from his father. David is everyman as he wishes he could be. He is us. It is that identification, that ordinariness, which provides the subtlest and most horrifying part of the book. For when the escaping Chrysalids are rescued by the Zealand airship, the pursuing Norms are killed – and the Zealander shows no remorse. Her evolutionary rationale for the destruction of inferior species is shocking – especially as the reader is left with no alternative but to accept that the Norms are inferior, and that in the coming struggle – far into the future, to be sure – they should lose, whether they are neighbours or not. In effect, the Zealanders are really no different to the Norms – they aim to preserve their species above all else. Both sides have privileged power above ethics – with some justification. But is some enough? David, who is like us ordinary in his extraordinariness, may dislike the reasoning of his new friend and may think fondly of some of his former family, but he is on his way to a new family, a new community, and his place in it promises to be as secure as his father’s is within the old. In effect, he has escaped his father only to take his place. Genetics will out, one way or another.